The plethora of produce is incredible: cherries to figs, to apricots, peaches, plums, grapes, figs, apples, and the list goes on. Having projects away form home get a little frustrating. I want to cook! I want to have fresh produce all the time. I want to make food and feed it to the people I love. I made this pie when I was home alone and had some fruits around the house and an extra pie dough that I needed to use. I found seedless white grapes hanging from a beautiful cluster that I had to break apart into small pearls. I found some luscious red plums, halved then diced into chunks. I like my pie with a flakey crust, and soft flavorsome filling. 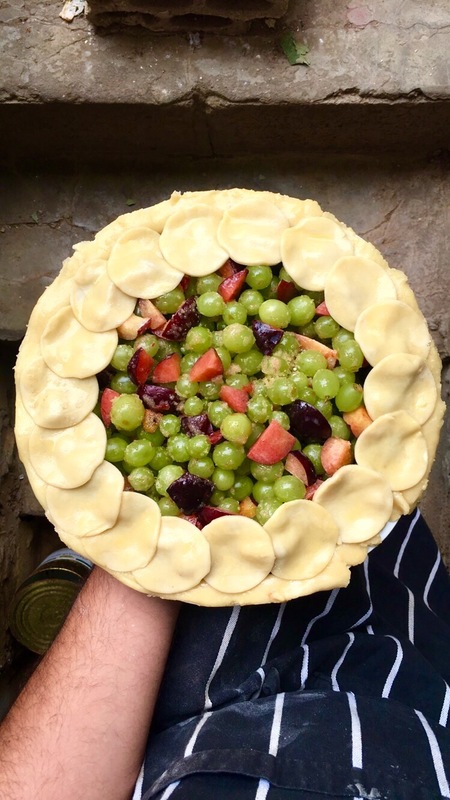 A thick crust of layers of butter and flour dough, encrusting the flavorful filling of ruby plums and pale green grapes fragrant of orange blossom water and cardamom. A middle eastern flavor profile in a western recipe. Best of both worlds. Wash and dry the grapes. In a large bowl separate the grapes from the stems. Cut the plums into small cubes and add to the grapes. This entry was posted in Dessert, Lebanese, Recipe and tagged cardamom, cardamon, Dessert, food blog, food blogger, fusion dessert, grape pie, lebanese blogger, lebanese food blogger, mediterranean, mediterranean dessert, orange blossom, orange blossom water, Pie, pies, plum pie, spice pie, sweets. Bookmark the permalink. I’m working my skills with every passing day. Did you check my first Kibbeh making video on my instagram and on the Facebook page?